John Osgood Prescott was born on 2 July 1871 in Lowell, Massachusetts, as the son of John Humphrey Prescott and Lydia Jane Osgood. John Osgood was the younger brother of Frederick Marion Prescott. On 19 Oct 1898 he married Elvie/Elva May Loomis from Manchester, Connecticut. On 28 June 1900 their son John Herman Prescott was born (Brooklyn, King, NY). International Zonophone Company incorporated in Jersey City on 7th of March, 1901. F. M. Prescott became Managing Director and his brother J. O. Prescott was one of the shareholders. Apparently John O. Prescott visited the UK In late 1903 and probably met (with) his brother Frederick Marion Prescott. On 17 January 1904 he left Liverpool on board of the SS "OCEANIC" and arrived in New York on 4 February 1904. 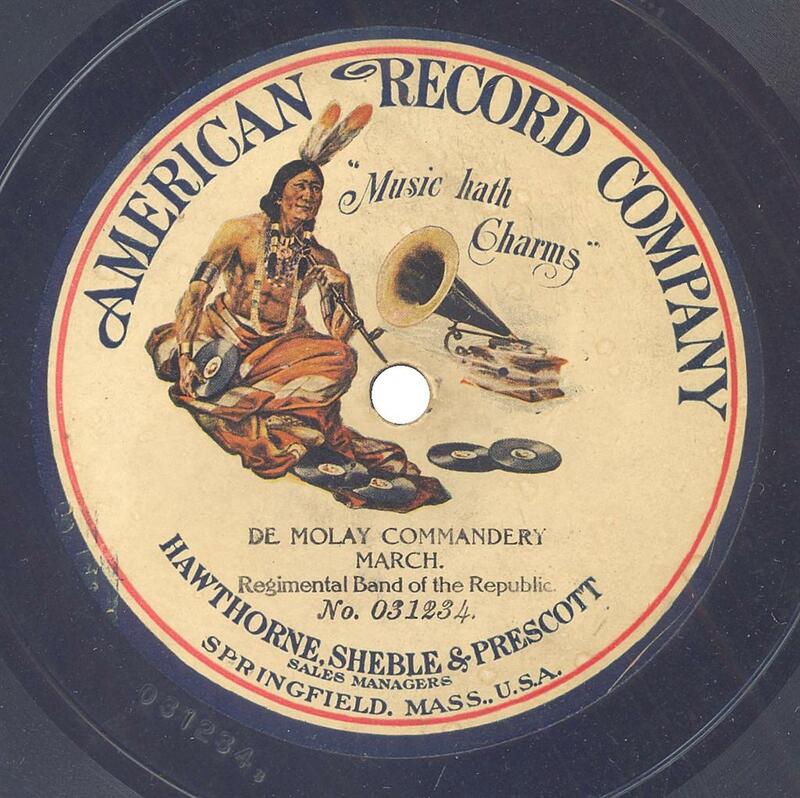 1904 - 1907 American Record Company (with Ellsworth A. Hawthorne and Horace Sheble). 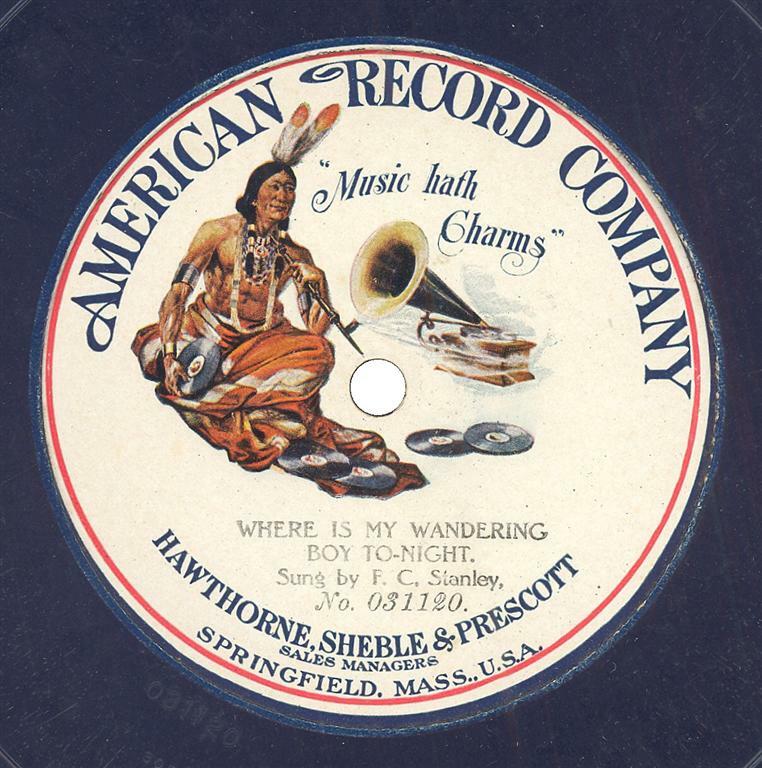 A record (10 3/4 inch) of the American Record Company has a white label showing an American Indian (Native American) holding a record in his right hand and a pipe in his left hand, while listening to a phonograph/gramophone. On both sides of the spindle-hole (at 3 o'clock and 9 o'clock) the Odeon temple. It carries the motto "Music hath Charms". "Music hath charms to sooth a savage heart, to soften rocks, or bend a knotted oak"
On 17 Feb 1907 his daughter Ruth Prescott was born in New Jersey. Filed a trademark application for Champion (Twoforone) Record in 1908 (without success). On 6 August 1909 John O. Prescott arrives in San Francisco, California, on board of the SS “Nippon Maru” departing from Hong Kong (China), Japan ports via Honolulu). ship's name: SS "NIPPON MARU"
On October 30th, 1909 John O. Prescott arrives in Yokohama, Japan. Business Japan-America. Phonograph Mfg. Co. 70-C Yokohama. Local Address: Hotel de Paris, Yokohama. We see him returning from Yokohama (Japan) on board of the SS “Tenyo Maru”(Hong Kong (China) and Way Ports). He arrived at San Francisco (California). ship's name: SS "TENYO MARU"
According to John O. Prescott's obituary in the Pasadena Star News, John O. Prescott built and managed factories in Constantinople (Turkey) and Yokohama (Japan) before World War I. 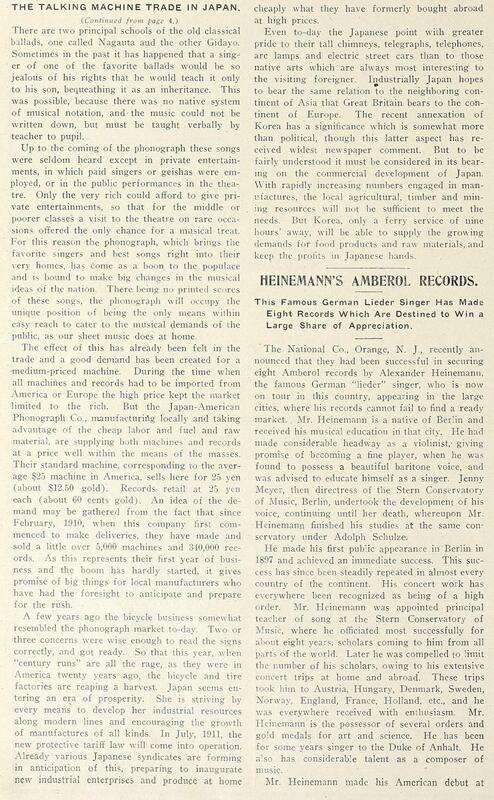 Founder of Nipponophone in 1910: Frederick Whitney Horne (internet). 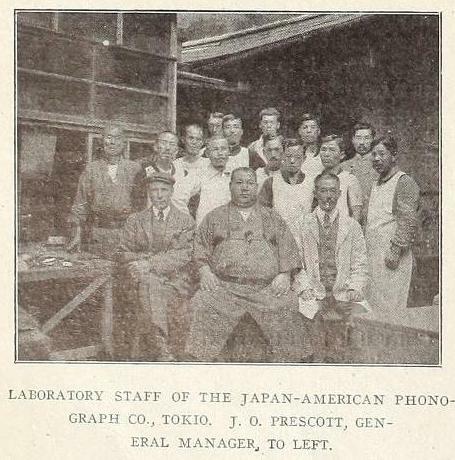 In 1911 Columbia established a Japanese subsidiary called the Nipponophone Company with its main plant in Kawasaki. Russell Emerson Hunting (not: Russell Hunting Jr.)(1897-1966), son of the wellknown Russell Dinsmore Hunting (1864-1940s), was Head of the Nipponophone Recording Department.from 1920 to 1923. (sources: Donald L. Hunting / California Passenger Lists / Kenney, p. 72. 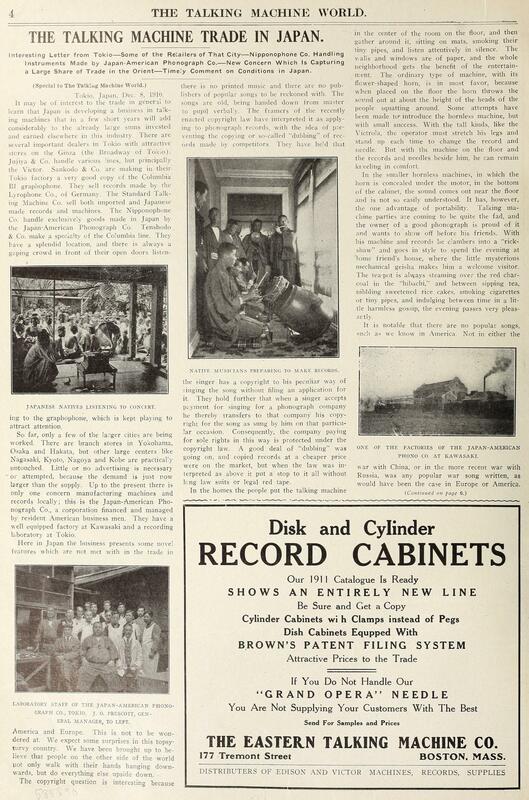 Talking Machine World XVII, 1 (Jan. 1921); 3. What record factories could John O. Prescott have built and managed before World War I? Could he have been involved in helping Hermann and Julius Blumenthal set up their Blumenthal Record and Talking Machine Company (Orfeon)? Although the beginnings of the first independent record company in Constantinople are shrouded in mist, I have found a number of documents which clearly indicate that John O. Prescott (and possibly his brother Frederick M. Prescott too) was involved in setting up the factory of Blumenthal Frères. The Blumenthals were faced with the choice of going on with Odeon or starting a new company for themselves. The problem with these letters is that they do not contain firsthand knowledge. I am informed that Blumenthal in connection with the ODEON is going to open a small factory in Constantinople, and also that they will keep an expert as to be able to take [=record] and issue always immediately all the novelties for the territory under the control of Constantinople viz. : Bulgaria, Serbia, Ottoman Empire, Greece, Egypt & Syria. They will save the duty into the Ottoman Empire which is expected to be raised in a month or so to 15%, and the freight, which is also an important item and therefore be able to give better terms. Pressing the records in Constantinople [it] will save them also to keep a heavy stock which otherwise is unavoidable considering the many different languages to be dealt with in the Orient. Certainly this small factory will be run very economically, but notwithstanding will give them a great advantage over all the competitors. That the factory will be opened is true, as Mr. Blumenthal who paid me a visit a few days ago confirmed the fact. Now, if Blumenthal together with ODEON think it worthwhile to establish some presses in Constantinople, why should we not find it also profitable? I understand that the ODEON people are going to erect a small factory in Constantinople. According to CERTIFICATE OF REGISTRATION OF AMERICAN CITIZEN (of September 18th, 1910) John O. Prescott arrived in Yokohama, Japan, on October 30th, 1909. Business Japan-America. Phonograph Mfg. Co. 70-C Yokohama. Local Address: Hotel de Paris, Yokohama. I am about to go abroad temporarily; and that I intend to return to the United States [in] two years. We should like to know position with Blumenthal at Constantinople.We still hear rumours that Prescott is recording for him [= Julius Blumenthal] and that he [Blumenthal] has bought his own pressing plant. Please go [to] Constantinople at once and report to us. I was informed that Blumenthal has still not settled with the ODEON, but that in the meantime he had some turkish singers up in Berlin and recorded in a neutral[?] factory. He will call the records "ORPHEUM" [=ORFEON - HS], probably to create confusion between the name ODEON and ORPHEUM, which sound about alike. This being the case, I wrote Abravanel & Benveniste, stating that I was ready to give them the exclusivity and that I was going to prepare the contract. Unfortunately, up to now I have received no news from Salonique, probably in cause of the Italo-Turkish war, which upsets everything in my territory. I dare not, under the circumstance, push things too much, naturally I shall give no notice to our present agents before having definitively settled with Abravanel. I shall keep you posted. I am informed that Messrs. Blumenthal have finally carried out their intention, already mentioned to you in my report of April the 30th, 1910, to open a small factory in Constantinople. It seems that Mr. Prescott [which Prescott? Frederick Marion or John Osgood?] has joined [the] Blumenthals for this enterprise, that they are actually recording and that a great part of the machinery is already in Turkey. It is of course too soon to foresee whether this move will prove, in the long run, a success, but what is already sure is that it will create us a great competition throughout my territory. Will you kindly consider the matter and let me know whether you feel inclined to dig a counter-mine. That the Blumenthals had begun their own operation is further corroborated by a report on Lindström and allied companies (dated January 1912) to the Chairman & Board of Directors of The Gramophone Company written by one of the Managing Directors, Sydney W. Dixon or Alfred Clark. (In Minute No. 2803, which is cited at the beginning of the report, reference is made to this same "Managing Director" without naming him ...). "Take over Blumenthals' Turkish factory and Trust press all Turkish and Egyptian records there. Send one of the superfluous ODEON or BEKA press factory foremen there and transfer a Recording Engineer there permanently." A letter was submitted from Mr. Vogel dated December 27th reporting that Messrs Blumenthal & Prescott were at present erecting a record factory in Constantinople, and pointing out that this would create a serious competition, and enquiring whether the Company would consider any counter move. It was DECIDED to advise Mr. Vogel that at present we see no possibility of being able to manufacture in Turkey. In late 1911 John O. Prescott was in Europe. It is not known when he arrived in Europe, but it may have had to do with the Blumenthals’ new record factory in Constantinople. 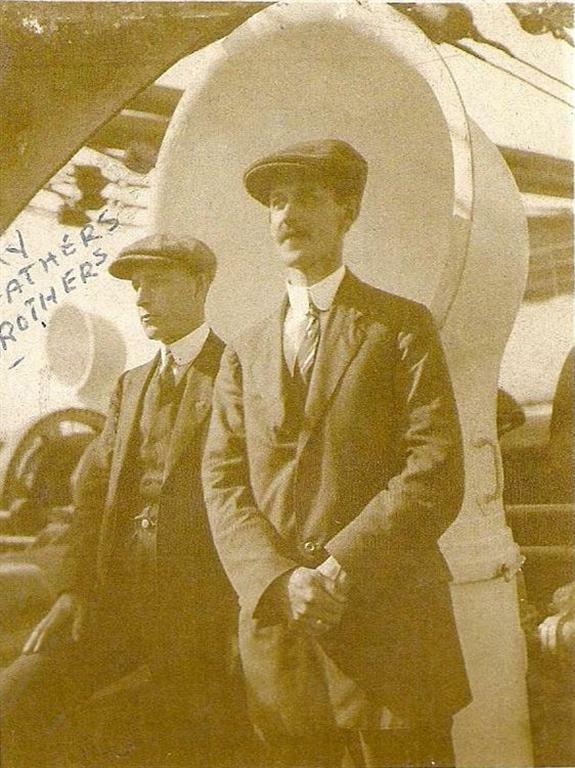 On the 4th of January 1912 John's brother, Frederick Marion Prescott, left the United States for England. Arrived in UK on 10 January 1912. Emergency Passport (1460c) issued on 31 January 1912 by American Embassy London. I desire the passport for the purpose of travelling to Turkey. On 17 July 1912 he boarded the SS “OLYMPIC” at Cherbourg (France) bound for America and on 24 July 1912 he arrived at New York. John O. Prescott was returning from Blumenthal business in Constantinople, TURKEY. Permanent address: Cheshire Ct., New Haven, Conn.
John O's. son John Hermon filled out the same Conn. Military Census form, gave same address. John Hermon PRESCOTT also had to register for the draft, WWl, record dated 9-12-1918. He gave his permanent address as Cheshire, New Haven, Conn., listed as a student at Middlebury College in Vermont. Gave his closest relative as: John Osgood PRESCOTT, father, Cheshire, New Haven, Conn.
Starr Company [GENNETT] Sending Expedition to Make Records of Melodies of Hopi Indians. Valuable Contribution to Recorded Music Will Be Made by Expedition Near Reservation of the Hopi Indians in Grand Canyon, Under Direction of J. O. Prescott and E. [= Ezra] C. A. Wickemeyer. Richmond, Ind., June 5. - An interesting contribution to talking machine recorded music is being made by the Starr Piano Co., which is sending a recording expedition to the Grand Canyon to make recordings of the melodies of the Hopi Indian tribe. The expedition is under the direction of J. O. Prescott, phonograph expert, and E. C. A. Wickemeyer, recording engineer. The representatives of the Starr Piano Co. are working in co-operation with Dr. J. Walter Fewkes, who is in charge of the Bureau of Ethnology of the Smithsonian Institute at Washington, D. C. Dr. Fewkes is considered the leading authority on matters relating to the Indians and is the only white man ever initiated into one of the secret societies of the Hopi Indians. All of the recording is being done in the Grand Canyon about 100 miles from the Hopi Reservation. The apparatus was set up with the co-operation of the Indians by ponies. The Hopi tribe is considered one of the most interesting in existence. They were one of the last tribes to receive Government protection. Less than 600 of the tribe remain. The tribe is little known because of the fact that when America was discovered only a handful of the tribe was in existence. The tribe is a sort of connecting link with the past because it dates back, in its mode of living, beyond the times represented by other and better-known tribes. Master records will be sent to the Smithsonian Institute and other museums. Records will be placed on sale throughout the country and a brisk sale is expected, particularly at the tourists' stopping places in the Southwest. A few months earlier, he [= Fred Gennett] and Arizona resort operator Fred Harvey decided to make records of Hopi Indian songs and sell them to tourists at Harvey’s El Tovar Hotel at the Grand Canyon. Gennett technicians rigged up a portable recording truck and hired Dr. J. Walter Fewkes, chief of the Bureau of Ethnology of the Smithsonian Institution, to supervise the sessions. They drove out to Arizona in December 1926, and Fewkes organized elders of the Walpi tribe of the Hopi Indians for performances of traditional songs. 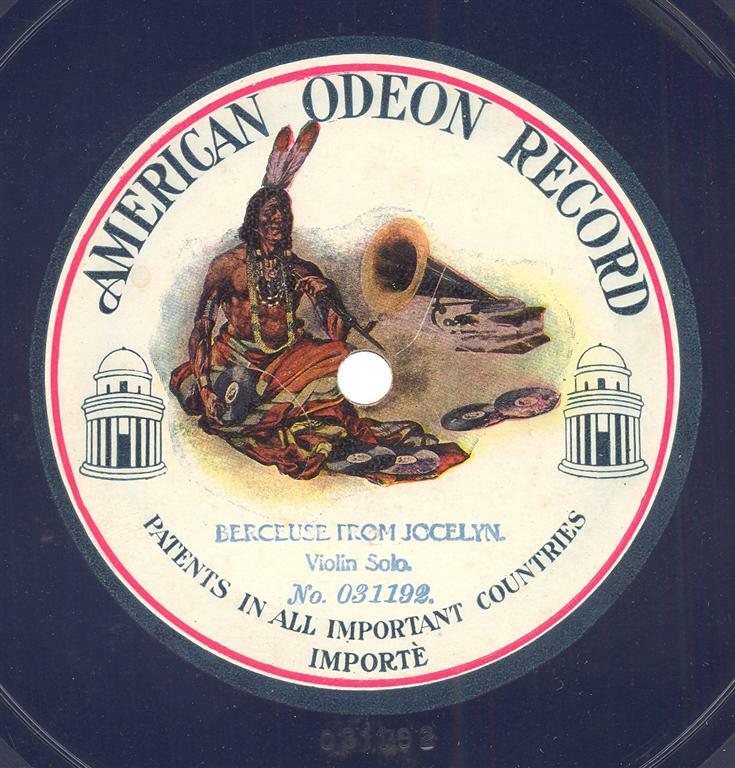 The dozen recordings, issued in early 1927, were the last acoustically recorded Gennett discs and possibly the first pure ethnic discs ever issued by a commercial record label. From a financial standpoint, however, Starr Piano probably wrote off the Hopi project as one of Fred’s harebrained ideas. Such Hopi numbers as “Tacheuktu Katcina” and “Tuwina’Av” were not exactly hits with the general public. He [= Fred's son, Harry Gennett Jr.] also drove to Arizona to record the Hopi Indians, in a repeat of the unusual recoding session organized by his uncle Fred back in 1926. Apparently had a contract with Gennett to introduce electrical[ly recorded] records. Chief of the Columbia Phonograph Company's research department. Afterwards he married Frances Wood. John O. Prescott moved to California in ca. 1936 or 1937. On 14 June 1946 John Osgood Prescott died of a heart attack at his home, 2802 North Lake Avenue in Altadena, Los Angeles, California. His second wife Frances Wood died on 8 October 1966 in Pasadena, Los Angeles, California.